The CLASS Act establishes a national voluntary insurance program for purchasing community living assistance services and support, with the aim of helping individuals with functional limitations to achieve personal and financial independence while alleviating burdens on family caregivers. Employed individuals who are at least age 18 may be eligible to participate in the CLASS program, generally through their employer. There is no underwriting and premiums vary only by age. A five-year vesting period is required to receive benefits, and an individual must have earned at least enough income to be credited with a quarter of coverage under Social Security rules ($1,120 for both 2010 and 2011)1 for three out of the five vesting years. At the time of enrollment, individuals must also not be in jail or a patient in a hospital, nursing facility, or similar institution. Under the CLASS program, a cash benefit that averages a minimum of $50/day will be paid to eligible beneficiaries that meet vesting requirements, with no lifetime limit. The cash benefit is paid daily or weekly into a beneficiary’s Life Independence Account and may be used to buy nonmedical services and supports needed to maintain independence at home, including: home modifications, assistive technology, accessible transportation, personal assistance services, home care aides, and nursing support. Services may be provided by a family member. Benefits are expected to be scaled from 2 to 6 levels based on the beneficiary’s level of functioning, and payments are triggered by a minimum level of functional impairment. Functional impairment will be defined by the inability to perform 2 or 3 activities of daily living (ADLs) without substantial assistance; or by substantial cognitive impairment requiring supervision for the individual’s health and safety; or by other similar conditions as determined by regulation. There are six ADLs that are defined: eating, toileting, transferring, bathing, dressing, and continence. Functional limitations must be expected to last for a continuous period of more than 90 days and must be certified by a licensed health care professional. There is presumptive eligibility for active enrollees that are discharged from certain institutions that provide long-term care. Benefits are intended to supplement rather than supplant other health care benefits, and program participation does not affect eligibility for other governmental benefits. For those institutionalized beneficiaries who are enrolled in Medicaid, however, only 5 percent of the cash benefit goes to the enrollee and 95 percent goes toward the facility cost of care. This has the effect of reducing Medicaid expenditures. For Medicaid beneficiaries receiving Home and Community-Based Services (HCBS) or in Programs of All-Inclusive Care for the Elderly (PACE), the split is 50-50 between the enrollee and the Medicaid program. In all cases, Medicaid provides secondary coverage for the remainder of costs incurred. 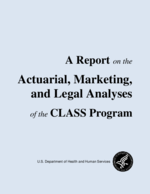 The CLASS Act requires the Secretary to develop at least three actuarially sound benefit plans, with premiums established so as to assure solvency over a 75-year period. The program establishes a nominal premium of $5, indexed to the CPI, for individuals with income below the poverty line and for full-time students under age 22 who are actively employed. The premium is to be loaded by no more than 3 percent to cover administrative expenses. The monthly premiums determined for an individual at the time of enrollment in the CLASS program may remain the same for as long as the individual is an active enrollee except that they may increase (1) to keep the program solvent or (2) for an individual who has a 3-month or more lapse in payment of premiums. In the case of a lapsing policyholder, the amount of the premium adjustment would depend on the timeframe before reenrollment. If the individual reenrolls within 5 years of the beginning of the lapse, his premium will be age-adjusted as if for an initial enrollment, but the individual would receive credit for prior months of paid premiums. If the individual reenrolls after 5 years from the start of the lapse, the individual does not receive credit for prior months of premiums paid, and is subject to a penalty on top of a new issue-age premium, with the penalty being the greater of 1 percent of the issue-age premium for each lapsed month, or an amount the Secretary determines to be actuarially sound. Full-time students paying the nominal premium will also be subject to a new age-adjusted premium upon ceasing full-time student status. Although premiums are intended to remain the same for an individual with continuous enrollment, the Secretary may adjust premiums for enrollees if the 20-year projection of premium and benefit outlays indicates an imbalance that threatens program solvency. Exempt from such increases would be active enrollees who meet all three of the following criterion: (1) are age 65 or older, (2) have paid premiums for at least 20 years, and (3) are not actively employed. Any unpaid benefits as a result of death or failure of a beneficiary to elect to receive benefits before the end of a 12-month period (benefits cannot be rolled over from year to year) revert back to the CLASS Independence Fund. The CLASS Independence Fund may be held only for: (1) investment, (2) to pay administrative expenses, and (3) to pay cash benefits. No taxpayer funds are to be used to pay benefits, although the law is silent on whether taxpayer funds may be used to pay administrative expenses. Similar to Social Security and Medicare, the CLASS Independence Fund will have a Trust Fund, a Board of Trustees, a Trustee’s Report (with 75-year projections), actuarial opinion provided by the CMS Chief Actuary, and an Advisory Council. If the program is determined to be not sound, premiums may be increased and/or new enrollment may be stopped, or legislative action may be recommended.